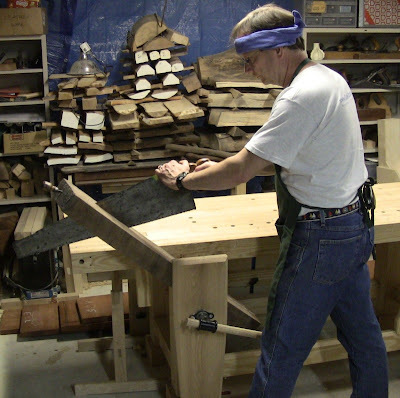 This past Spring, I joined SAPFM, The Society Of American Period Furniture Makers. In March, 2012, the Connecticut Historical Society (CHS) in Hartford, CT, will be hosting a 6-month juried exhibition of SAPFM member work. The deadline for submitting pieces is this coming October 31. CHS even offered to allow members controlled access to their collection to allow them to survey items to reproduce for the exhibition. I contacted Mickey Callahan, the SAPFM Exhbition Coordinator, to inquire about participating and visiting the museum. As a novice, I knew there wasn't enough time for me to tackle a complex piece, and of course as a hobbyist with limited time, scheduling a visit is difficult. 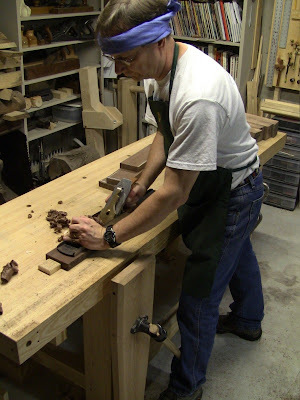 As an alternative, Mickey asked me if I knew how to make a cabriole leg, and suggested building a Queen Anne foot stool for which he had plans. That seemed like a good stepping stone project. I even have a nice stock of walnut that would be suitable, after Patrick Leach sent me an email last year about a fellow in New Hampshire who was clearing out his basement shop in preparation for selling his house; he'd had the wood for 30 years, intending to build a table. I was flattered that Patrick thought of me! He, of course, was buying up the tools. SAPFM has recently added downloadable plans to the member section of its website, and Mickey's foot stool, his own design based on decades of experience with period furniture, is included. Last week I downloaded it and started to work. Completing it in time for the deadline will be a challenge. In addition to the woodwork, it has an upholstered slip seat. As my reference, I'm using Don Taylor's 1989 Fine Woodworking article "Upholstering a Slip Seat" (in fact, this finally convinced me to sign up for paid FWW online access, since it's only $14.95 a year for subscribers). Mickey told me he gets his supplies from DIY Upholstery Supply, so today I ordered supplies and a set of basic upholstering tools from them. Instead of horse hair, I'm using rubberized horse hair, which Mickey uses in his slip seat upholstering class at Connecticut Valley School of Woodworking, but otherwise I'm following Taylor's instructions exactly. I have several references for cabriole legs, all by Phil Lowe (I really like his instruction): his 1983 FWW article "Cabriole Legs", and two DVD's, Carve a Ball and Claw Foot [VHS] and Measuring Furniture for Reproduction: with Phil Lowe . The videos cover a lot more material than their titles suggest. 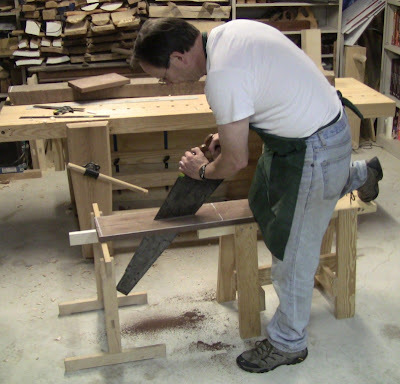 His recent FWW article "4 Chisel Tricks" is also a good reference for both the leg shaping and the joinery work. The first steps, as always, are stock preparation. The rail pieces were easy, but the leg pieces were some work. Mickey's plans printed out, and the walnut stock, 4/4 for rails in front, 12/4 for legs in back. 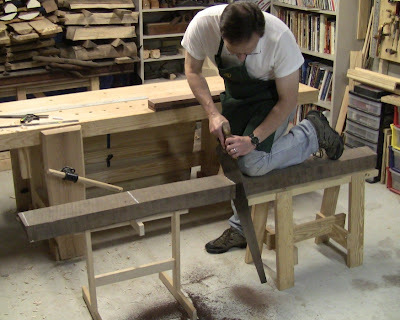 Crosscutting the 4/4 stock to rough length. 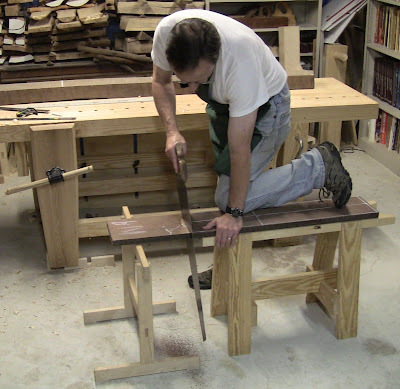 Cross cutting the 12/4 stock for legs. It's not quite wide enough to rip each length into two leg blanks. Ripping down to rough width. This is a pretty hefty rip. The rough-cut rails and legs. 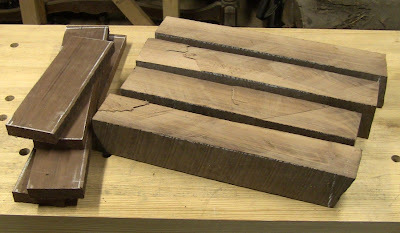 Once the pieces were rough size, the next step was to four-square them all to exact finished dimensions with the FEWTEL sequence: Face, Edge, Width, Thickness, End, Length. 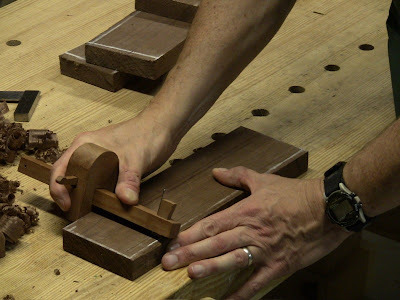 Jointing the face of a rail. Marking for width, referencing the fence against the jointed edge. 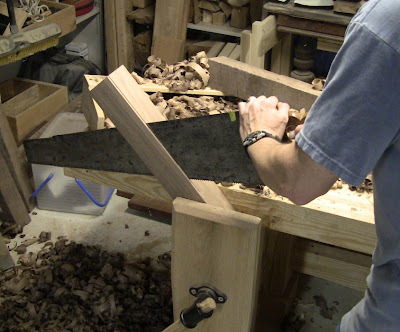 Taking heavy shavings to reduce the width quickly with a heavily cambered jack plane. I followed this with the jointer. Marking all around the edges and ends for thickness. Again, using the jack for reducing thickness quickly, followed by the jointer. This wood worked very easily along the grain even for the heaviest cut; I didn't have to plane diagonally or straight across the grain. Periodically sighting across winding sticks to check for twist. After using a smoother, the dressed faces and edges. 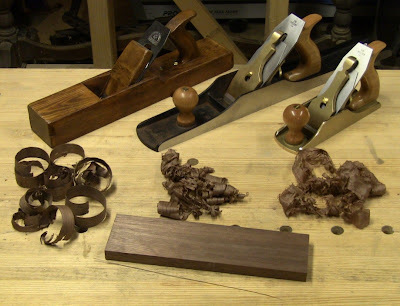 This shows the planes I used, and the shavings they produced. 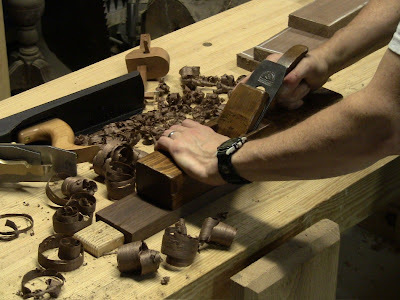 Measured with a dial caliper, the heavy shavings from the jack are about 22 thousands of an inch for fast stock removal, the shavings from the jointer are about 5 thousandths, and the shavings from the smoother are about 2 thousandths. What's that brown line in front of the piece? That's the whisker of wood off the edge from the marking gauge; when the plane reaches the gauged line and removes the whisker, you're done. Shooting the first end. The shooting board leaves a precisely squared end, the plane taking wispy end-grain shavings. Cutting the other end to length. I actually cut it just a hair long, then shot that end on the shooting board as well. In addition to precise squaring, this allows you to get down to precise length, a thousandth at a time. 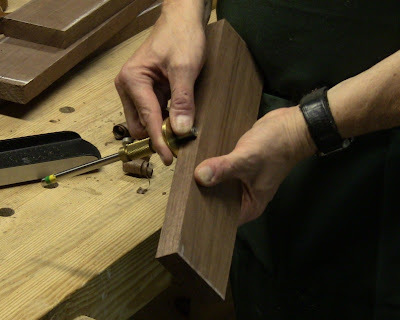 Reducing the width of a wider piece by ripping. 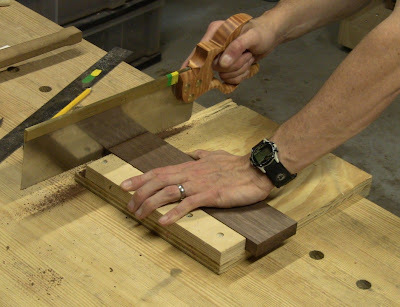 This is a useful alternative when it would be too much to plane off, or the scrap is too large to waste. Two leg blanks squared up after roughing down with scrub plane and metal and wooden jack planes. These planes all have different width irons, cambered to different radii. Each face of the wood responded a little differently, so I used whichever plane did the fastest job of stock removal. There's a lot of meat to remove here, so this is a bit of work. This thicker stock also didn't plane as easily as the thinner stuff, particular on the faces tangential to the growth rings. Ripping off a nice thickness that would have been a lot of work to plane down. The pieces squared up to finished dimensions. This completes the rough work. 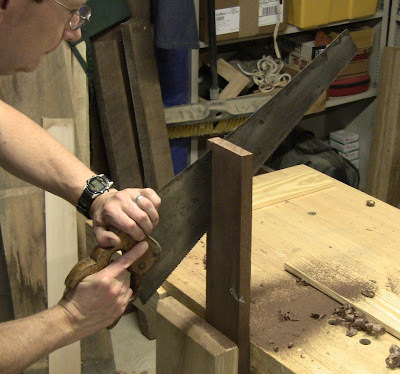 Next will be shaping the legs and doing the joinery; that's where this project really gets interesting. 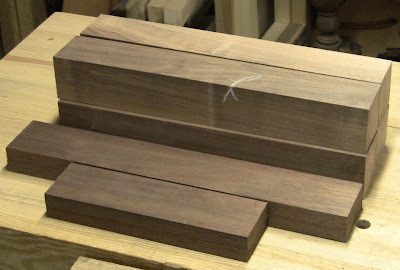 Note that because of the cabriole shape, only a small portion of the leg blanks actually needs to be square and flat. That will be more apparent once they're sawn out. Hi Steve. Another superbly detailed post. Can I ask roughly how long it took from rough cut to finished boards? Looking forward to the next post. Steve, Great post, the only thing I would change is the thicknessing of the rails. If you reference off the show face there is no reason the rails need to be any particular thickness. In period work I have been able to examine, thickness seems to be random unless there is a real reason for a particular thickness. Thanks! The 4/4 stock was much softer than the 12/4 stock. They may have been the same species, but certainly not the same tree. The rails were very fast, well under an hour for all four. The legs were significantly longer. The wood was much denser, plus had a few knots. Roughing down all four sides with the planes and jointing was a good hour per leg. I ended up ripping pieces off of the last two leg blanks because of that, leaving just enough to take off with the jointer. 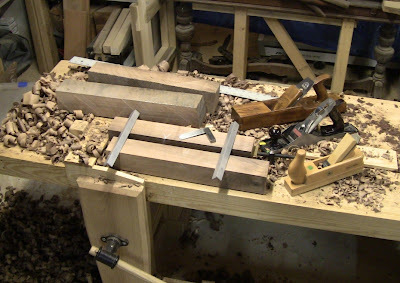 The final sequence I came up with was to take a heavy layer off all the dirty sides with the jack planes to get to clean wood, then take an additional heavy shaving, then pick two adjacent faces to joint. The thickest remaining dimension I ripped off as much as I could, then jointed it, and finished off the last face with planes. This cut a little time, plus broke up the heavy planing work. But I would say the legs rounded out to about 4 hours total. Millcrek, thanks, that's an interesting point. However, the thicknessing of the rails went so easily that skipping it wouldn't have been that much of a savings, not even 10 minutes out of the whole job! But as I mentioned in the other comment, they were very soft. It might be worthwhile in harder wood. It would certainly have been useful in the legs. I seriously considered leaving the two outside faces of each leg rough, since cutting the cyma shape would eliminate it all anyway. The only tricky part is it throws off the balance of the pad foot when turning, although an off-center turning isn't that big a deal. But I figured it was safer to get everything to finished square dimensions according to the plan, rather than risk screwing up some alignment or cut because I didn't compensate properly. 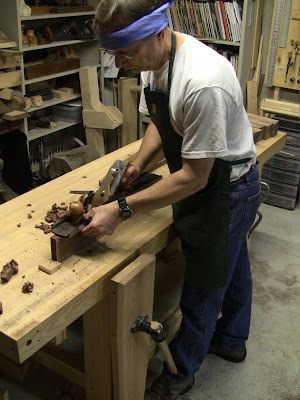 Great handtools lesson ! 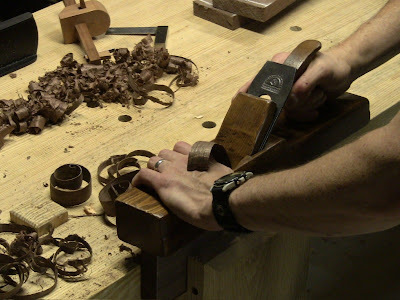 I enjoyed the pic about thickness shavings with the trhee planes. May I ask where is the marking gauge blade made from ? Thanks, Julio! 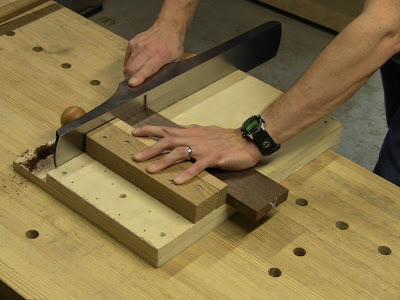 The marking gauge blade is made from a saber saw blade. The metal works quite well for this, and is easy to work. I filed off the teeth and sanded off the paint, then ground the cutting end on sandpaper and honed it on sharpening stones. 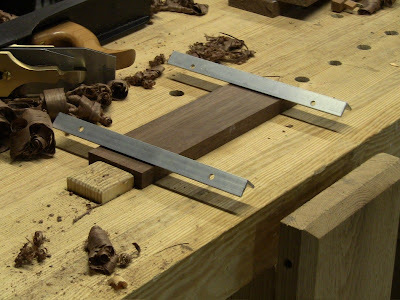 You can see the whole gauge build in my "Making A Cutting Gauge" post under the Projects heading. This piece is great Steve. I've been wanting to do a Queen Anne piece for a while now and it just hasn't happened yet. Great work here! I'm looking forward to this project and plan to go to the exhibition. I liked your low profile version of the shop bent as an outfeed stand so much that I made it as well. Thanks for the ideas! The Roubo is next!